Soboba Casino is honored to welcome Gene Stachowski, Marketing Director, talented team leader and strategic marketing guru to their board of distinguished leaders. Soboba Casino has taken leaps and bounds towards the build of their Casino Resort, but Gene is no newbie to the transitional process. Between 2002 and 2004, Gene played a key role in the development and implementation of the new Morongo Casino Resort and Spa, a AAA Four Diamond Resort and Spa which opened in late 2004. Gene is joining Soboba at a crucial moment in history for both the casino and the Soboba Tribe. While C.W. Driver Construction is getting busy building their extravagant new multi-level property, Gene will be busy assisting the General Manager in formulating Soboba’s overall strategic marketing plan, pushing the boundaries of exciting promotional concepts and driving revenue for a new generation of Casino Resort. Gene has had over 26 years of marketing experience in gaming, hospitality and tribal enterprises. 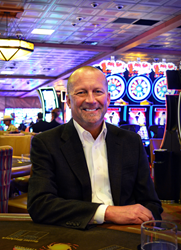 Prior to joining the Soboba Casino team, Gene served as the Executive Director of Corporate Marketing for Buffalo Thunder Resort and Casino of the Pojoaque Gaming Enterprise in Santa Fe, New Mexico. In his capacity, Gene rebuilt and revitalized the marketing team by analyzing, planning, implementing and executing marketing initiatives set forth in an effort to maximize productivity and revenue.